It was originally written by Steven Lewis who has kindly given us permission to post it here. Steven runs HDI Tuning Ltd who specialise in creating custom remaps for all vehicles fitted with the 2.0HDi engine and Bosch EDC15 ECU. His company has a good reputation on various Peugeot forums and you can view some customer testimonials here. What is done in a bad remap? What else should and shouldn't have been done? 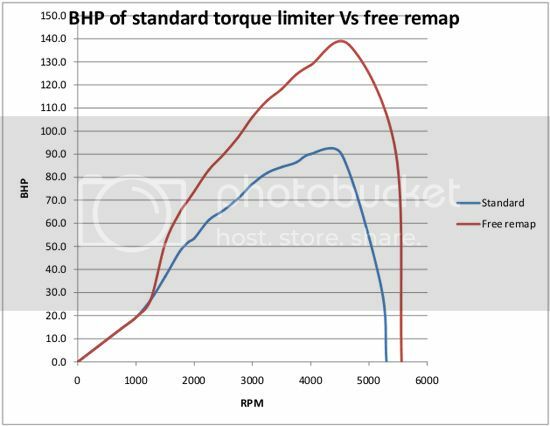 This document has been written to educate those planning on using a poor quality remap. These are often given away for free on ebay. Sometimes these are used by large companies who charge lots for their ‘remaps’. Hopefully this document will be understandable to those who have a basic understanding of how a Diesel engine works. 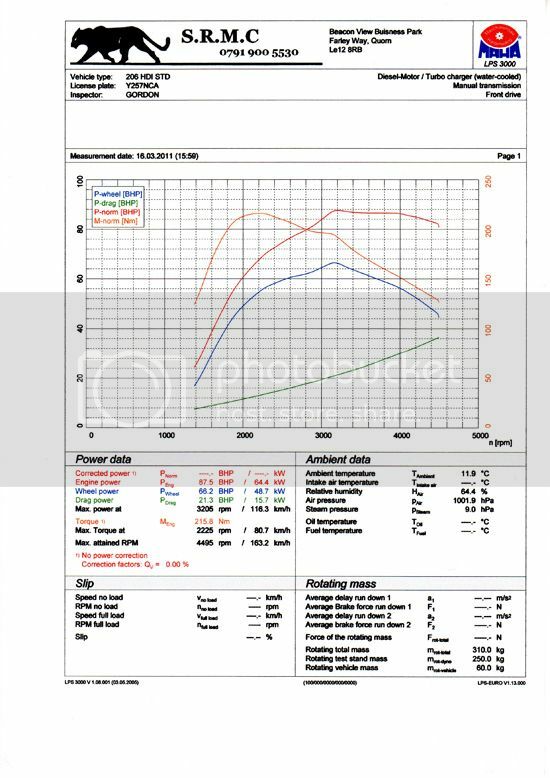 The ECU file compared in this document is from a Peugeot 306 HDI. This vehicle comes with a 2.0HDI common rail diesel engine capable of producing 205 Nm of torque and a peak power output of 90 BHP from the factory. A common rail Diesel engine controls the injection of fuel electronically with the help of a highly pressurised fuel rail, which is ‘common’ to all of the injectors. This eliminates the need for fuel pump timing, as the point at which the injectors fire is controlled through the ECU. The fuel pump is driven by the engines timing belt. On the 2.0 HDI the fuel pump pressurises the fuel to 1350 Bar under full load (this can consume up to 5 BHP of power). Due to the incredibly high fuel pressure, the fuel that is injected into the cylinder is atomised, creating a cleaner burn and a shorter injection time due to the increased rate of flow (when compared to conventional diesel engines). The relatively short injection time creates the possibility for multiple injections during one stroke of the piston. The first injection event is called ‘pre-injection’. This involves injecting a very small amount of fuel into the cylinder during the compression stroke. (approx 1mm3). This gradually raises the temperature of the cylinder before the main injection event. The pre injection process reduces combustion noise by up to 1dB per cylinder and allows for a higher peak cylinder pressure during the main injection phase. This also reduces the amount of time it takes for the fuel to ignite under the main injection event. The next injection event is indeed the main injection phase. This is a much larger quantity of fuel, and provides the main power stroke of the engine. Injected quantities can reach 51mm3 per stroke (under full load with standard ECU settings). Newer models of the HDI also take advantage of ‘post injection’ The purpose of this late injection is to burn as it passes through the diesel particulate filter in order to burn off any soot which could potentially clog the filter. The HDI 90 engine has no electronic boost control, and comes fitted with either a Garrett GT1546s or a 3K K03 turbo charger. The boost pressure is controlled by a mechanical pressure actuator which opens the waste gate and diverts flow away from the exhaust turbine. Now the IQ will only be limited by the torque limiter if this is the lowest limit of all the other fuel quantity maps. The easiest map to understand is the accelerator request map (please refer to Figure 2). 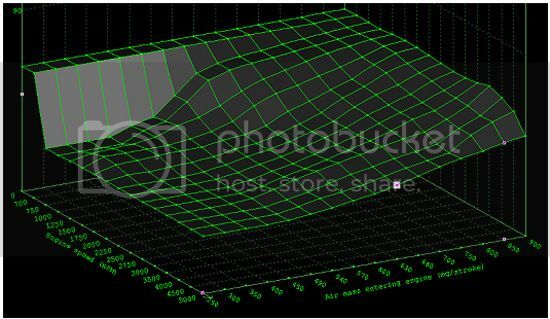 This has axes of throttle pedal depression (in percent) against engine speed (in RPM). The Z axis of this map is the requested quantity of diesel. Only at 100% throttle depression is the maximum value requested. In this map however the maximum value is now 64mm^3 of Diesel. 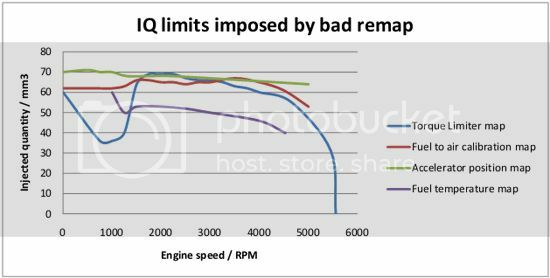 This means that at 100% pedal request this map has no effect on IQ limitation but the torque limiter does. In order to reduce the production of black smoke due to incomplete combustion, the amount of air going in to the engine is recorded. The IQ is then limited with respect to the mass of air entering the engine, and the speed of the engine. This gives the fuel to air calibration map (more commonly referred to as the smoke map, please refer to Figure 3 below.). At the highest air flow of 900mg/stroke, fuelling (Z axis) is limited between 62-64 mm^3 of diesel. Only when the air flow is lower than around 700mg/stroke will the smoke map have any great effect upon the injected quantity. In the event of a faulty Mass Air Flow sensor (MAF) power can be limited as the ECU thinks there is not a high enough air flow to burn the fuel completely. In a high quality remap, full fuelling would not be given until 900 mg/stroke of air. The next map that limits power is the fuel temperature map. This limits the IQ if the fuel temperature gets too high. This is to prevent overworking and damaging the high pressure fuel pump. At a temperature of 82 degrees or lower, the injected quantity of diesel is limited to 53mm^3 at around 2000 RPM. Please see Figure 4. 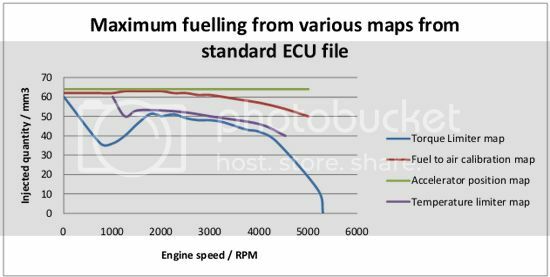 If the peak values of each map are compared it is apparent that the torque limiter is always the limiting map under the standard ECU settings. To remap a Diesel car more fuel must be requested. The greater request in fuel converts directly to a higher torque output and also a higher BHP output. 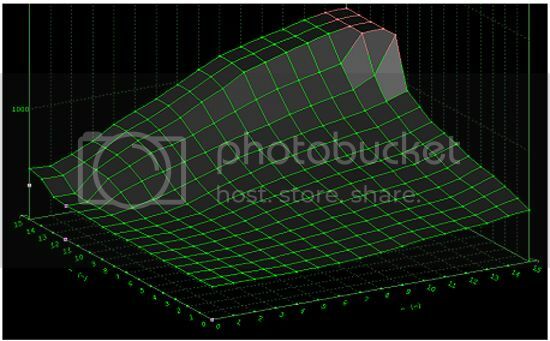 BHP can be calculated by multiplying the torque output in ft/lb by the engine speed in RPM and dividing by 5252. A good ‘tuner’ would alter the necessary maps to increase the injected quantity of diesel, and would calculate the required fuel quantity in the torque limiter for the desired BHP output. However, in this document we are looking at a bad remap, and these are not altered in the ways in which one would expect them to be. ALL of the bad remaps I have come across for the HDI engine have managed to miss the fuel temperature dependant limiter. This immediately restricts fuel to just 53mm^3. This is not far from the stock settings so no obvious performance gain would be seen. To counteract this failed attempt, many ‘tuners’ alter the injector calibration maps. The reasons why this is bad are covered in more detail further on in this document. The file used in this comparison can be found for free on many websites, and it’s easy to see why. The first map we will look at is the torque limiter. This has been altered all over by the same amount (18mm^3) without any concern for the points at which fuelling is increased. Through some very crude calculations it is possible to calculate what the expected BHP output of this torque limiter would be by applying a torque conversion factor to the IQ. In the standard TL this comes out to 90 BHP at 4000 RPM. In the modified TL this comes out at 137.3 BHP at 4660 RPM. 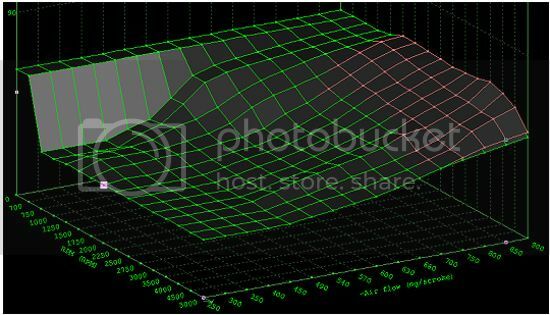 Note how the ‘tuner’ has tried to increase the engines maximum speed past 5300 by altering the TL axis. This is not the way to do this as there are other limiters in place. 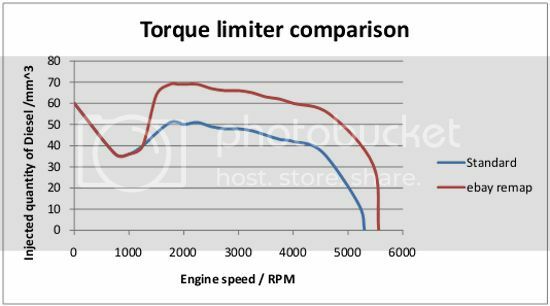 Figure 7 shows a comparison graph of the calculated BHP output for each different torque limiter. After looking at the calculated data it becomes apparent that the tuner has NO IDEA what they are doing. Requesting 140 BHPs worth of fuel on a standard stage one tune without an intercooler fitted and increased boost is a recipe for disaster. Clouds of thick black smoke would follow, and it’s likely the turbine blades would incur damage due to excessive EGTs. Luckily, the ‘tuner’ responsible actually missed an important map so these high fuelling levels would not actually occur, and also didn’t increase the other maps to the right amount to prevent them from limiting the torque limiter. The first map that was missed completely was the fuel temperature map. Immediately this puts an IQ limit at 53mm^3. The accelerator request map was altered, but only to a maximum value of 70mm^3. See Figure 8. The smoke map was also altered, but again by the wrong amount. This time the smoke limiter was increased to 66-67mm^3. 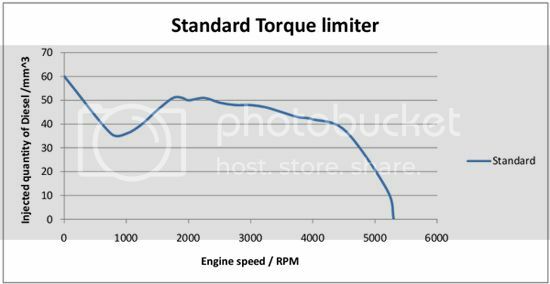 Yet again this is lower than the quantity requested by the torque limiter which was originally the lowest setting of all the maps in the standard ECU file. If a new comparison is carried out between the maps, (see Figure 10) the fuel temperature limiter is now controlling the amount of diesel being injected in to the engine rather than the torque limiter as before. 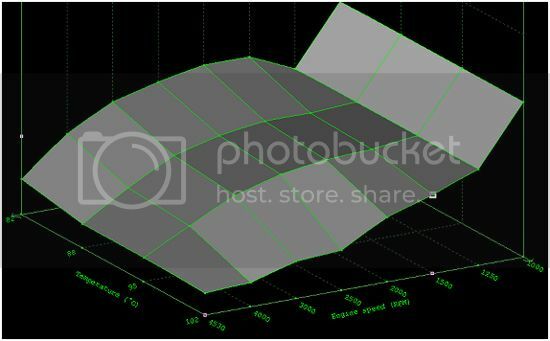 Note how the limits are no longer well separated for smooth running conditions as in the standard ECU file shown in Figure 5. The peak power output should now be approximately 98 BHP using some simple calculations. When driving with one of these remaps the power gain seems a lot more than 8 BHP and there is usually a large cloud of smoke behind the car and some other strange rattly noises. If we look further in to the file we find that the injector calibration maps have been altered. 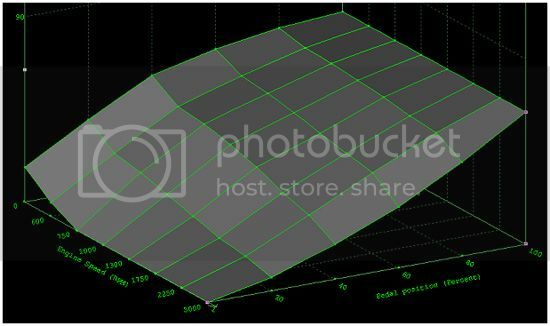 The injector calibration maps have axes of fuel pressure and the requested amount of fuel. The Z axis is the opening time of the injectors in micro seconds. These maps are highly calibrated to suit the injectors fitted to the car. This allows the ECU to deliver a precise amount of fuel when requested. For cars fitted with an MPG trip meter, altering this map will give false MPG readouts. The problem with altering the injector calibration maps is that it is very hard to work out just how much fuel is actually being requested. As we have already found out, the ‘tuner’ has requested 140 BHPs worth of fuel, but would only be getting 98 BHP. This was obviously not a great result, so instead of finding the limiter, the calibration maps were altered. The calibration maps should only be altered if the injectors have been upgraded. Before it is possible to work out exactly how much fuel has been requested, we need to know if the fuel pressure map has been altered. Fuel at a higher pressure can flow at a greater rate through the injector nozzle in a given time when compared to fuel of a lower pressure. If we use the standard opening time with the known fuel quantity and rail pressure we can rearrange this equation to find the constant required to calculate the new fuel quantity. In this case it works out to be 625.898. If this ‘constant’ is plugged into the equation with the new opening time of 861.6 micro-seconds the fuel quantity works out to be 50.6mm^3 per stroke. Using the previous BHP calculations this works out at around 108 BHP maximum. Now that is now a more noticeable power increase, but it definitely does not compare to a proper remap of around 120 to 125 BHP! Note how the calibration map has been changed in the top left corner by a large amount. To an unskilled tuner this part of the map would look like the ‘biggest’ part, so they would probably think it right to change it. 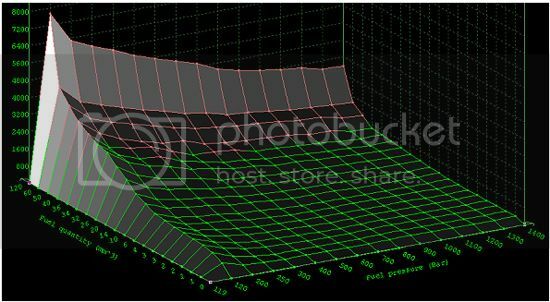 If you look at the axes you will see this part is actually at just 119 bar of fuel pressure. This kind of pressure would only be reached during cranking. Completely useless for a performance remap! What else should and shouldn’t have been done? Ok, so we can already see that the fuel calibration maps have been changed due to missing the temperature limiter. Now we want to know why this is bad, and what else should have been changed. If we open the injector for longer than the ECU thinks it would be, the time at which the injection period ends will be far too late. This can cause high EGTs as the fuel will still be burning during the exhaust stroke (in some cases the changes to the calibration maps can be much more extreme, this map is relatively tame compared to some I have seen from ‘professional’ companies) High EGTs result in damage to the turbine blades within the turbo charger and can eventually result in turbo failure. Now the next part is what really annoys me. On the HDI 90 there is NO electronic boost control. This means that there is no need to alter any of the turbo maps, as the wastegate is controlled by a mechanical pressure actuator. In this file all of the turbo maps have been altered. 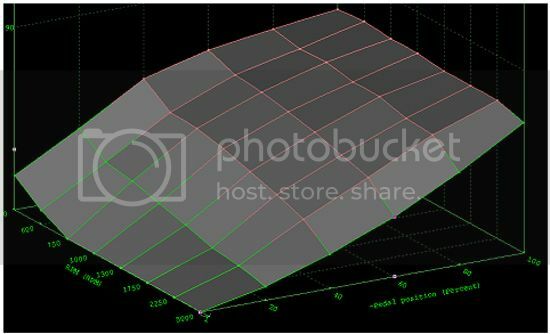 This confirms that the ‘tuner’ who made this file had no knowledge of the HDI engine, and they certainly didn’t test this file on any cars before selling it on eBay. Overall a very informative article and I will certainly try and get more information up about remapping and diesel tuning as it is a very popular topic at the moment. Readers who already have a remap file might be interested in one of my other articles on how to upload a remap file to your Peugeot 306 HDI. This was very interesting and informative. Thanks for posting and thanks to the author for taking the time to explain it in such great detail. Yes, very interesting and thank you for the post. Nice document! Can someone tell me the formula that relates IQ with torque output or BHP?